I V Gone, under jockey Joseph Belloc, Jr., setting the fastest time for the El Moro de Cumpas Maturity at Rillito Park Sunday afternoon. 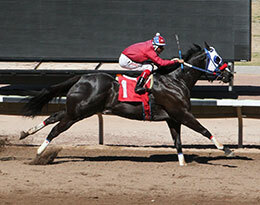 TUSCON, AZ-MARCH 5, 2018--I V Gone, a graded stakes winning son of multiple stakes sire IVORY JAMES set the fastest qualifying time on Sunday for the El Moro de Cumpas Maturity at Rillito Park. The eight fastest qualifiers will return to the Arizona raceway on Saturday, March 17 to vie for the winners' share of a $30,000-est. purse going 400 yards. Ridden by jockey Joseph Belloc, Jr., I V Gone quickly cleared the field on the way to a dominating two-length win in the second trial. His time of :19.669 seconds into an 8-mph crosswind set the bar as the top qualifying time. Alma Ramos owns the 8-year-old gelding from the Takin On The Cash mare Bye Bye Bygones. Rigoberto Guillen conditions the 12-time winner of nearly $182,000. Bred in Oklahoma by L.P. Frank, I V Gone won the Grade 3 Will Rogers Derby Challenge as a 3-year-old. Sunday's trial race was his first start in 2018 after finishing 1-1-1 in five starts last season when the Golden Driller Stakes at Fair Meadows. For a complete list of El Moro de Cumpas Maturity qualifiers, times, sires, dams, owners, breeders trainers and jockeys CLICK HERE.